The Bi-College Blue Bus is part of theTri-Cotransportation system that links the Tri-College Community ofBrynMawr, Haverford and Swarthmore Colleges. 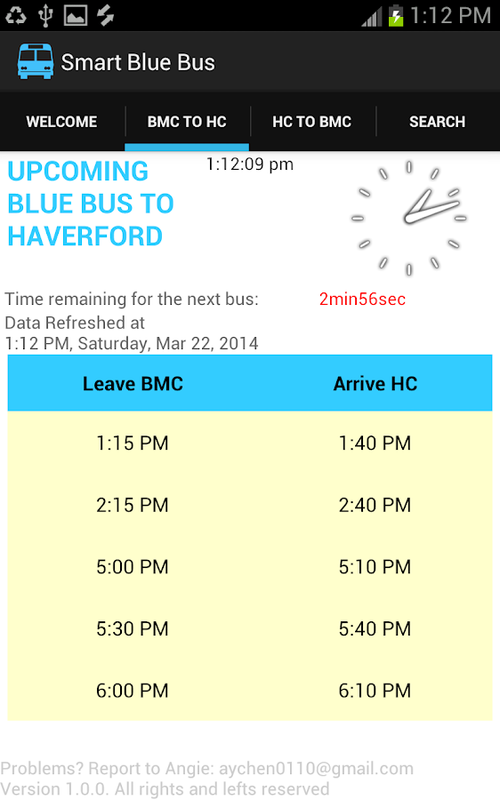 This application, written by a student from Bryn MawrCollege,enables easy blue bus schedule checking and searching. - calculates and displays the time remaining to catch nextbus.Afraid of miscalculating the time and hence miss a bus? Thisappdoes the calculation for you. Additionally, the number willturnRED if you have less than 3 minutes. - no network connection needed! The app works well whileoff-line.All the data are contained within the app and so it canworkperfectly without wifi/cellular data. - and yes, it's fast and battery-friendly. The updated resultscanbe retrieved and displayed instantly with minimal operations.Notusing any network connection means it's impossible to have anytypeof network delay or battery consumption related to connectingto aserver. - supports customized schedule searching by allowing you toselectany date and time. View the full schedule at any giventime! - last but not least, it's FREE of charge and ads. Thedeveloperbelieves that everyone likes a free app with clean andad-freeinterface. 1. The icon for the app is provided as CC0 1.0 Universal (CC01.0)Public Domain Dedication. 3. The developer has been in contact with the Bryn MawrCollegetransportation department. She will update the database assoon asthere's a change in the schedule. No need to worry aboutdata goingout-of-date. The Bi-College Blue Bus is part of theTri-Cotransportation system that links the Tri-College Community ofBrynMawr, Haverford and Swarthmore Colleges.This application, written by a student from Bryn MawrCollege,enables easy blue bus schedule checking and searching.HIGHLIGHTS- automatically reads the system's current time and day of theweekupon selecting a tab (and/or scrolling the screen)- automatically updates the bus schedule according to thecurrenttime and date (no need to be frustrated by the messy bluebuswebsite anymore)- calculates and displays the time remaining to catch nextbus.Afraid of miscalculating the time and hence miss a bus? Thisappdoes the calculation for you. Additionally, the number willturnRED if you have less than 3 minutes.- no network connection needed! The app works well whileoff-line.All the data are contained within the app and so it canworkperfectly without wifi/cellular data.- and yes, it's fast and battery-friendly. The updated resultscanbe retrieved and displayed instantly with minimal operations.Notusing any network connection means it's impossible to have anytypeof network delay or battery consumption related to connectingto aserver.- supports customized schedule searching by allowing you toselectany date and time. View the full schedule at any giventime!- last but not least, it's FREE of charge and ads. Thedeveloperbelieves that everyone likes a free app with clean andad-freeinterface.NOTES:1. The icon for the app is provided as CC0 1.0 Universal (CC01.0)Public Domain Dedication.2. The full official schedule is available here: http://www.brynmawr.edu/transportation/bico.shtml3. The developer has been in contact with the Bryn MawrCollegetransportation department. She will update the database assoon asthere's a change in the schedule. No need to worry aboutdata goingout-of-date. Get bus, metro and local train timetable in Mumbai, Delhi, Chennai,Kolkatta Bengaluru, Hyderabad & many more cities.Find thefastest route to your destination using combination of buses,trains, metro rail, monorail or just plain walking, we have it allcovered. Get the cost & duration of different journey optionsalong with private transportation like rickshaw, cars and cabs tomake a decision. What’s more? You don’t even need Internet toaccess your city timetable. It’s easy to use – It’s a city in thepocket and it’s Free! Have fun transiting.SUPPORTED CITIES ANDAGENCIES:Mumbai: • Mumbai Suburban / Local Train -• Western Line -Runs between Churchgate and Dahanu covering major stations likeMumbai Central, Dadar, Bandra, Andheri, Borivali, Virar -• CentralLine - Runs between CST and Karjat/Kasara/Khopoli covering majorstations like Dadar, Kurla, Thane, etc. -• Harbour Line - Runsbetween CST, Andheri and Panvel providing connections betweenCentral and Western Lines. -• Trans-Harbour Line -• Diva-RohaShuttle -• Dahanu-Panvel Shuttle• Bus -• BEST (BrihanmumbaiElectric Supply and Transport) - The iconic red coloured buses thatrun through the heart of Mumbai. -• NMMT (Navi Mumbai MunicipalTransport) -• TMT (Thane Municipal Transport) -• KDMT (KalyanDombivli Municipal Transport) -• VVMT (Vasai Virar MunicipalTransport) -• MBMT (Mira Bhayander Municipal Transport)• MumbaiMetro - Line 1 connects Versova, Andheri to Ghatkopar• MumbaiMonorailDelhi: • Bus -• DTC (Delhi Transport Corporation) -• DMRC(Feeder Bus)• Local Train - • Delhi Metro -• Red Line, Green Line,Blue Line, Orange Line, Violet Line, Yellow Line• Gurgaon Metro -•Rapid LineChennaiBengaluru(Bangalore)KolkataHyderabadAhmedabadPune: • Bus -• PMPML (PuneMahanagar Parivahan Mahamandal Limited)• Local Train (Pune-LonavalaLocal)And many more cities.Bellary, Bhavnagar, Bhopal,Bhubaneshwar, Chandigarh, Indore, Jaipur, Kanpur, Kolhapur,Lucknow, Ludhiana, Nagpur, Nashik, Rajkot, Surat, Vadodara,VijayawadaDidn’t find the city you are looking for? Don’t worry weare working hard to add more cities.KEY FEATURES:• Trip planner:Compare between multiple routes to your destination. A to B journeyplanner including all transport modes (Walk, Bus, Metro, Monorail,Train, Tram)• Offline Timetable: Get timetable/schedules anddetailed routes of your regular buses, trains or metro lines at anystop/station without an active internet connection.• Step by stepnavigation: Easily find your way on the map, including walkingdirections.• Real time service alerts: Receive push notificationsabout any megablocks, traffic, accident etc. on your favouriteroutes (Beta Phase)• Favourite your most important Routes: Click onthe ‘Star’ tab to view your journey results.• Filter your resultsto get exactly what you are looking for (Eg: Fast/Slow Trains,Platform No, AC Bus Etc)• Want to make the search easy? Just saveyour locations for quicker trip planning.And this is not it! Lotsof more handy features coming soon...Till then enjoy your transitand we will do everything we can to make it enjoyable!Bored ofwaiting for the next bus/train or using different apps fordifferent cities? Looking for a complete POINT A to POINT Bnavigation? Your search ends here. TransitPedia is a local publictransit app and a one-stop solution for all your transit needs.We'dlove to hear from you and stay connected:• Like us on Facebook:http://facebook.com/transitpedia• Follow us on Twitter:https://twitter.com/transitpediaapp• Questions / Comments /Suggestions? Email us at [email protected] like, share,recommend & review this app. It will only help us serve youbetter.